Massage and the manipulation of the muscle groups of the body relaxes and eases muscular strains, tears, aches, trapped nerves and other similar body pain. Toxins are flushed from the muscles using Lymph fluid, these are then exited from the body over time through your urine. This toxin release helps speed up muscle recovery time which is good for all of us, but particularly helpful if you're an athlete or where being physically fit forms part of your daily or working life. Massage increases the range of joint-motion by stretching ligaments and tendons, keeping them supple. It helps diminish the pain and discomfort associated with muscle strains, fractures, sprains, Sciatica and aching joints in addition to more complex issues like Lordosis or Osteoarthritis. It increases oxygen and blood flow around the body, bringing fresh nutrients to areas of the body that might have previously been blocked or received only diminished nutrient flow. 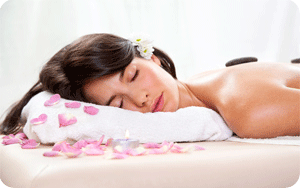 Massage also stimulates the skin and nervous system while at the same time relaxing the nerves themselves. Regular treatments will have an accumlative affect. Your holistic massage therapy will last between 30 - 90 minutes, depending on which treatment you have chosen. You will be given time to undress privately (leaving undergarments on) and asked to lie down on my comfortable massage couch. You will then be covered with fresh, clean towels and will never be fully exposed at any point during the whole treatment, you always remain covered. Only the area being worked on at that moment will be uncovered. If you become worried or feel uncomfortable during any treatment don't hesitate to say so, I shall stop immediately and give you any time and help that you may need. All massages can leave you feeling thirsty so it is important to drink a sufficient amount of fresh, clean (preferrably filtered) water. NB: Please take comfort in the knowledge that the breasts and genital areas of the body are NEVER massaged. Denise Owen Massage Therapy is operated as a purely holistic and therapeutic business, registered with many of the UK's leading complementary therapy bodies and governing councils who provide protection and knowledge for their customers and staff of the therapy businesses alike. I offer help and bodywork therapy to people suffering with varying levels of pain, discomfort, muscular & skeletal problems, anxiety and discomfort as well as other medical conditions that can be alleviated with bodywork therapy, with the express intention of giving restorative aid to help reduce their debilitating symptoms. If you have browsed my website with the hope of finding a massage service that provides 'extras', then you will be sorely disappointed, I run a wholesome family business and politely suggest you leave.